The student-to-faculty ratio is 6-to-1 Median class size is 14 Rice professors teach 86 percent of courses. Choose from more than 50 majors and 18 minors. Become the next leader in your field. At Rice, we transform outstanding students into global scholars who envision new possibilities and leave their imprint on the world. Rice students are strongly encouraged to explore their intellectual passions. You are not required to declare a major until the end of your sophomore year. Farinaz Koushanfar, an associate professor of electrical and computer engineering, has been recognized as an up-andcoming leader in her field; she has won a National Science Foundation CAREER Award and a Presidential Early Career Award for Scientists and Engineers. Koushanfar made the MIT Technology Review’s 2008 list of “35 Innovators Under 35” for her development of a digital “lock” that protects microchips from hardware pirates. George R. Brown School of Engineering Engineering at Rice has long been known for the rigorous grounding its students get in science, math and computing, the basis of all engineering. But engineering at its best is a creative process and at Rice, student creativity is sparked by challenging research, realworld design problems, international experiences and opportunities in leadership development. Seventy percent of engineering undergraduates participate in research by the time they graduate, working with faculty who are internationally recognized as leaders in their fields. Thirteen engineering faculty are members of the U.S. national academies and 26 of our younger faculty are winners of prestigious National Science Foundation CAREER Awards. Design Oshman Engineering Design Kitchen is driven by real-world problems, many of them posed by practitioners in the Texas Medical Center and local industries. Students work on these projects in the state-of-the-art Oshman Engineering Design Kitchen. International programs, such as Engineers Without Borders and Beyond Traditional Borders, enable students to make a difference in peoples’ lives by applying their engineering knowledge and skills. Research and internship programs like NanoJapan expand the types of experiences available to students beyond traditional study abroad. The activities of the Rice Center for Engineering Leadership enhance the technical education our students receive with innovative programs in leadership training and practice, communication skills development, entrepreneurship and teamwork. School of Humanities Rice’s School of Humanities offers the essentials that broaden a mind and round out a life: literature and history, art and philosophy, religious studies and 12 languages. You’ll have abundant access to opportunities in undergraduate research, internships, and study abroad. Plus, perhaps most importantly, humanities students benefit from the resources and collaborative energy of talented and award-winning faculty in 10 academic departments and three research centers. Beyond Rice’s student literary journal, silver-screen cinema, dramatic arts theater, renowned installation art gallery and student-run exhibition space, our invaluable relations with universities abroad inspire and expand the intellectual development of our students. Recent faculty distinctions include the Phi Beta Kappa Teaching Prize, Mellon Foundation New Directions Fellowship, Guggenheim fellowships, a Yaddo artist’s residency, top prize in the Webb-Smith Essay and Iowa Poetry competitions, and one of three finalists for the national Robert Foster Cherry Award for Great Teaching. Further, the Faculty Scholarly Productivity Index (which measures achievement in areas such as publications, grants and awards) ranks the school’s history, religious studies and philosophy programs among the top 10 in the nation. As a humanities major, you won’t be limited by the definition of your discipline. The resources available to Rice undergraduates help foster cooperation and scholarship at every level, not only between the humanities and other areas of the university but between Rice scholars and the rest of the world. School of Humanities Building: Nineteen percent of Rice undergraduates earn their primary degree from the School of Humanities. Douglas Brinkley, professor of history and a fellow at the Rice University Baker Institute for Public Policy, the CBS News Historian, and a best-selling author. Seven of his books have been selected as New York Times Notable Books of the Year. In 2013, he teamed up with actor Johnny Depp to edit “House of Earth,” a previously unpublished novel by Woody Guthrie that Brinkley uncovered. Brinkley teaches classes on 20th-century American presidents and politics. architecture Sarah Whiting, dean of the School of Architecture, has published extensively on urban and architectural theory, and she’s particularly interested in how 21st-century buildings and urban structure are reframing the nature of public life. Whiting is a practicing architect as well; she’s a partner and co-founder of the firm WW Architecture and has previously worked with Peter Eisenman, Michael Graves and the Office for Metropolitan Architecture (OMA) in Rotterdam. School of Architecture The Rice School of Architecture, ranked No. 3 among the nation’s top Bachelor of Architecture programs by DesignIntelligence, combines an international scope with an intentionally small and intimate setting. The school maintains a diverse enrollment of about 125 undergraduates and 60 graduate students representing many states and nationalities. The core faculty’s 20 architects, historians and theoreticians are complemented each year by visiting critics, scholars and lecturers, transforming the school into a think tank that explores the challenges and possibilities of contemporary architecture and urbanism. The undergraduate program in architecture leads to a fully accredited Bachelor of Architecture professional degree. A truly unique feature of this program is a year long internship, called the Preceptorship Program, in which the school arranges for each student to work in one of the top design firms in the world. Recent offices have included Diller Scofidio + Renfro, Rogers Partners Architects, SHoP, and Thomas Phifer in NYC, the Renzo Piano Building Workshop in Paris and Genoa, Kohn Pederson Fox in London, JohnstonMarklee in L.A., and OMA Hong Kong, among others. In addition to formal coursework, architecture students you can explore a rich program of all-school lectures, public symposia, exhibits, studio reviews, design-and-build opportunities and community outreach. Additionally, students can apply to take a full semester of study at the school’s Paris program or apply for traveling fellowships. Our students come from many different countries and from every corner of the U.S., mirroring the diversity of the faculty and visiting professors. We are committed to architecture’s public role and its potential to improve our shared environment. The School of Architecture operates on a global stage and is located in one of the fastest growing and most dynamic cities in the United States. Our think-tank atmosphere uniquely integrates individualized instruction with exposure to the best architects and thinkers in the world. We prepare our graduates to become transformative figures in the field. Pictured above: A project that proposed alternative urbanization strategies for Hong Kong. This studio traveled to the site, and students worked in small teams that combined graduate and undergraduate students, and is an example of how RSA seeks innovating students for the rapidly changing conditions of the environment. School of Social Sciences The School of Social Sciences’ curriculum covers a diverse range of subject matter: anthropology, economics, political science, linguistics, sport management, psychology and sociology. With seven departments, three interdisciplinary majors and five institutes and centers, you’ll have abundant opportunities to learn, explore and grow in your chosen field. You might join an archaeological dig in an ancient city, study attitudes toward race and religion, evaluate energy policy, or explore Rice’s new minor in neuroscience. To make the learning more meaningful, the school has created the GATEWAY program for undergraduates. Students complete internships, summer fellowships, independent research projects or international ambassadorships — experiences that enrich their education outside the classroom. Through GATEWAY, you’ll put your knowledge to work and learn firsthand how you can make a meaningful contribution to your field. The Kinder Institute for Urban Research focuses on urban populations with an emphasis on demographics and social issues in Houston and in major cities around the world. Its education programs, research and public outreach all contribute to the global conversation, connecting Rice to the rest of Houston and beyond. Forty percent of Rice undergraduates choose a major in the social sciences, so you can learn with — and from — a large group of peers. Social sciences faculty members offer exceptional teaching and mentorship. And you’ll have a crucial third element to complete your education: the chance to put your classroom knowledge to use, even before you graduate. The James A. Baker III Institute for Public Policy is one of the leading nonpartisan public policy think tanks in the country. social sciences Jenifer Bratter, Ph.D., is an associate professor of sociology and has spent her career researching and publishing on the issues of multiracial populations, interracial marriages, and race and ethnic relations. Bratter is also the program director for The Study of Ethnicity, Race and Culture, a campus-wide program in the Kinder Institute for Urban Research dedicated to advancing the intellectual community of scholars whose work examines the relevance of race in all its dimensions. Photo credit: Jennifer Taylor Larry Rachleff is renowned for his vibrant career, which takes him to stages all over the country. Rachleff is in his 22nd season as professor of conducting and music director of Rice University’s Shepherd School Orchestras, his eighteenth season as the music director of the Rhode Island Philharmonic. For 23 years he served as music director of the Chicago Philharmonic, and for five years, he was music director of the San Antonio Symphony. He has spent his summers guest conducting at Aspen, Tanglewood, the National Camp at Interlochen, the Music Academy of the West and the National Repertory Orchestra and has led the Camerata Australia on a tour of Japan. Music majors also benefit from their connection to Rice alumni who have set the stage for success. They hold positions in the Metropolitan Opera Lindemann Young Artist Program, the Houston Grand Opera Studio, the Domingo-Cafritz Young Artist Program, the Utah Opera Ensemble Program, the Seattle Opera Young Artist Program, the National Symphony Orchestra, as well as the Houston Symphony Orchestra. The Shepherd School’s renowned string quartet residency program has helped launch the careers of award-winning ensembles such as the Dover Quartet, Jasper Quartet and the Enso Quartet. Caroline Shaw ‘04 became the youngest person ever to win a Pulitzer Prize in music for her composition “Partita for 8 Voices.” Sasha Cooke ‘04 received a Grammy Award for Best Opera Recording for her performance as Kitty Oppenheimer in the Metropolitan Opera Premiere of John Adams’ “Doctor Atomic.” Double bass-player Thomas Van Dyck ‘03 was selected from among 250 musicians for his spot in the nine-member bass section of the Boston Symphony Orchestra. Designed by the internationally celebrated Spanish architect Ricardo Bofill, The Shepherd School is located in Alice Pratt Brown Hall, a $22 million facility that houses practice spaces, chamber music rooms, and recording and faculty studios. The hall also boasts three of Houston’s finest performing spaces, which feature outstanding acoustics and attract audiences of more than 70,000 music lovers each year. natural sciences Yousif Shamoo is a professor of biochemistry and cell biology, director of Rice’s Institute of Biosciences and Bioengineering, and the vice provost for research. He has been awarded grants from the Dunn Foundation and the National Institutes of Health to study how bacteria develop antibiotic resistance, and a Defense Threat Reduction Agency grant is allowing him to develop a test to determine whether a disease outbreak is caused by natural pathogens or ones created by terrorists. Shamoo is impactful in the classroom, too, receiving Rice’s George R. Brown Award for Superior Teaching. unsurpassed teaching Excellent teaching is at the heart of a great education, and Rice is home to some of the most distinguished faculty in the world. Dennis Huston is one of Rice’s most popular professors. He has won nearly every teaching award the university has to offer and was the first recipient of the Teacher of the Year Award given by the Council for the Advancement and Support of Education. His ability to spark a passion in students for performance, Shakespeare and public speaking have made this English professor one of Rice’s most engaging faculty members since he arrived in 1969. “I really like undergraduates and spend a lot of time with them,” Huston said. “In some way, I feel really close to them empathetically.” Teaching young people, Huston has said, keeps him young. And year after year, as students clamor for a chance to take his class, the power of good teaching grows stronger. Engaging Instruction Our professors thrive on conducting pathbreaking research within their fields and creating meaningful learning opportunities for their students. They also bring the excitement of discovery to the classroom. Beyond teaching you the critical concepts of their disciplines, Rice professors encourage you to develop your capacity for original and innovative thought. You will learn to think globally, reframe questions and challenge conventional wisdom. What you learn in the classroom is the foundation for an undergraduate experience enhanced by internships and fellowships, as well as by engaging discussions with celebrated guest lecturers, statesmen, international policymakers, and a host of other visionaries and dignitaries who routinely visit the Rice campus. At Rice, we support you in defining excellence for yourself, then achieving it. Rice is ranked No. 11 in the world for the significance and impact of its research, according to the CWTS Leiden Ranking. Riceâ&#x20AC;&#x2122;s natural sciences and engineering research is ranked among the top ten in the world. The BioScience Research Collaborative, pictured above, is one of Riceâ&#x20AC;&#x2122;s many research centers. The $300-million dollar center is the hub of bioscience and biotechnology research at Rice. The BRC is an innovative lab where scientists and educators from Rice and the nearby Texas Medical Center institutions work together to perform leading research that benefits human medicine and health. The facility is an interdisciplinary, interinstitutional catalyst for new and better ways to collaborate, learn and lead. Faculty members in all fields are fully engaged in research and discovery. Rice faculty conduct more than $100 million worth of sponsored research each year. A distinguished member of the Association of American Universities, Rice is the most productive research university in Texas and among the top 10 research universities in the country, according to the Faculty Scholarly Productivity Index. Birthplace of Nanotechnology Beginning with the Nobel Prize-winning discovery of the Carbon 60 molecule, known as buckminsterfullerene, Rice has led the nation in the fundamental understanding of the nanocosm as a means to solving our greatest problems today — human health; the availability of widespread, affordable and green energy; a clean and stable environment; and public policy that focuses our limited resources on solutions. Nanotechnology is the underlying knowledge base that enables these solutions. Nobel Prize winners Richard Smalley and Robert Curl made Rice the birthplace of nanotechnology in 1985. Now James Tour, below, is carrying the torch and pioneering new discoveries in the field. Tour is a professor of chemistry, computer science, and nanoengineering and materials science. A fellow of the American Association for the Advancement of Science, he was named “Scientist of the Year” in 2013 by R&D Magazine and recognized as one of “The 50 Most Influential Scientists in the World Today” by TheBestSchools.org. He has won national recognition for his research, including the Feynman Prize in Experimental Nanotechnology, the National Science Foundation Presidential Young Investigator Award in Polymer Chemistry, the Trotter Prize in “Information, Complexity and Inference,” and the NASA Space Act Award for his development of carbon nanotube reinforced elastomers. In addition to his research accolades, Rice has honored him with the George R. Brown Award for Superior Teaching, and the American Chemical Society awarded him with the ACS Nano Lectureship Award. A co-founder of NanoComposites, Inc., which specializes in nanotube-based composites, Tour has more than 70 patents, including an invention that incorporates new processes for the chemical modification of carbon nanotubes. Through work in his lab, he is making vital discoveries that advance technology, medicine, energy and electronics. Professors Maria Oden (left) and Rebecca Richards-Kortum (right) won the 2013 Lemelson-MIT Award for Global Innovation for their life-saving inventions and pioneering efforts to inspire and lead Rice students to invent and deliver low-cost technological innovations to improve health care for people in developing nations. Students take on design challenges under the director of Professors Oden ad Richards-Kortum in the Oshman Engineering Design Kitchen, Rice’s ground-breaking engineering design facility. Study of the City In 1982, sociology professor Stephen Klineberg assigned a group of his undergraduate students to conduct a survey of Houston-area residents. It was intended to be a one-time project, a snapshot study of Houston’s inhabitants — who they were, how they lived and what they believed. The next year, though, Klineberg repeated the project — and then the next year, and then the next year. That study, known as the Houston Area Survey, has tracked demographic and economic change in Houston for more than 30 years. Rice sociology students survey a random, representative sample of Houstonians each year, asking residents what they think about the local economy, where they stand on issues such as abortion and immigration, whether they feel confident about the city’s future and their own, etc. No other city in the United States is the subject of such a thorough, long-lasting study. And as Houston has grown, the Houston Area Survey provides a fascinating look at the changing demographics of the nation’s fourth-largest city. Every step of the way, Rice undergraduates have contributed to this important body of knowledge. That survey now has an institute that supports it: In 2010, Rice launched an institute for urban research, combining Klineberg’s Urban Research Center with the university’s Center on Race, Religion and Urban Life. The Kinder Institute for Urban Research remains devoted to maintaining the studies and annual surveys — and to reaching out to the Houston community with research and educational programs. An Evolving Revolutionary Zack Kopplin, a history major from Baton Rouge, Louisiana, garnered national attention for his campaign against creationism. In fact, the Huffington Post named him their first-ever “Troublemaker of the Year.” Starting in his senior year of high school, Kopplin launched a repeal of the Louisiana Science Education Act. This law allows creationism to be taught in public schools. He has built a coalition to fight the law; 78 Nobel laureate scientists are among those who have endorsed the repeal. Kopplin see his campaign against creationism as a fight for evidence-based science and increased funding for scientific research. He argues that without the proper science education, his generation will grow up without a clear understanding of evidence-based science. This, combined with his generation’s complacency, will prevent humans from fighting unprecedented challenges to their way of living and survival as a species. He cites the shrinking amount of living space and clean water and the discovery of superbugs that are resistant to antibiotics as some of the many threats we face. Comparing his fight to President Kennedy’s mission to send astronauts to the moon, Kopplin has named his campaign the Second Giant Leap for Humankind. In addition to winning praise from the Huffington Post, Kopplin has been featured by Vogue, the Washington Post, Slate, NPT, and other media outlets. He is a columnist for The Guardian. An Accomplished Social Scientist Asia McCleary-Gaddy, a psychology major from Staten Island, New York, has dedicated her research to the study of subconscious racism. During the school year, she works in the laboratory of Rice professor Dr. Michelle Hebl, whose research focuses on issues related to diversity and discrimination. In addition, thanks to the School of Social Sciences’ GATEWAY program and the Mellon Mays Undergraduate Fellowship Program, McClearyGaddy has spent two summers in a psychology lab at Columbia University. There, she has conducted research in physiopsychology, where perceptions and behavior are measured using physiological responses rather than selfreport inventories. These research experiences have given McCleary-Gaddy foundational knowledge for her own independent research project on stereotypicality. This area of psychology considers whether people of the same race are treated differently because of perceived differences in appearance. McClearyGaddy is studying whether stereotypicality influences the majors college students select. As she looks ahead to graduate school, she hopes to find ways to incorporate both race and gender studies into her social psychology work. An Astrophysics Star Anna Wright, an astrophysics major from Sandy, Utah, fell in love with the field at the age of 12, when she saw a Nova episode on supernovae. “I am particularly enchanted with the fact that there is still so much to learn in the field of astrophysics,” she explained. “It is an area that is constantly changing in the wake of new discoveries and theories, and one whose mysteries I think we will never entirely solve.” Wright won the 2013 Space Institute Award at Rice’s Research Symposium for her project, “Inference of Magnetic Field Strength through Interstellar Shock Wave Simulation.” Working with her Rice professor Patrick Hartigan, she has examined the later stages of star formation, during which young stars release supersonic jets of material into the surrounding material. At present, there is no way to measure the strength of the magnetic field associated with low velocity jets simply from observations of the corresponding shock wave. But Wright and Hartigan believe they have found a combination of emission line ratios that allows this to be easily discerned. They are just beginning the process of comparing their simulations to data from actual jets. After she graduates, Wright hopes to continue her work in computational astrophysics either at a university or national lab. A Healthcare Pioneer Rahul Rekhi of Katy, Texas, received a 2013 Marshall Scholarship and will pursue a master’s degree in international health policy at the London School of Economics and a master’s degree in bioengineering at Oxford University. A bioengineering and economics major, Rekhi chose to pursue both of these subjects because he recognizes that there is more to healthcare than science and technology. “You need to know how to get good healthcare in people’s hands and make sure it is affordable,” he said. “I knew I couldn’t just work in the lab and be content that lives were improving. It wasn’t the whole equation.” Rekhi served as an undergraduate researcher in the lab of Dr. Amina Qutub, assistant professor of bioengineering. Involvement with Rice’s Baker Institute for Public Policy opened additional doors for Rekhi. His mentor Dr. Neal Lane, senior fellow in science and technology policy and professor in the Department of Physics and Astronomy, steered him towards a summer internship at the National Science Foundation (NSF), of which Lane was a former director. Rekhi was also a summer research fellow at the MD Anderson Cancer Center and a health policy fellow at the World Health Organization. He funded his internships through prestigious fellowships, like the Truman Scholarship and Rice’s Wagoner Fellowship. Rice’s residential college system is the heart of campus life. Every Rice student is a member of a residential college, regardless of the choice to live on or off campus. These 11 units are small communities in which students live, dine and interact with faculty, staff and alumni. College Masters College masters are tenured faculty members who live with their families in houses adjacent to each college. Masters are a supportive resource for students and oversee all aspects of student life. They encourage broad cultural and intellectual pursuits, ensure the effectiveness of the college’s self-governance, and care for their students’ well-being. intramural sports, but it also offers the academic enrichment of lectures and special courses designed by fellow students. The faculty and staff members who serve as college masters and as resident associates will guide your personal and intellectual development. Your college will become both a social foundation and an academic haven — a living and learning environment that helps you assemble the pieces of your education into an elegant whole. Have Fun and Stay Fit Rice students like to exercise more than just their brains â&#x20AC;&#x201D; and everything you need for a healthy workout is at the Barbara and David Gibbs Recreation and Wellness Center. Inside the two-story facility, youâ&#x20AC;&#x2122;ll find weight and cardio rooms; courts for squash, racquetball, basketball; multipurpose activity courts for soccer, floor hockey, tennis and volleyball; and multipurpose rooms for personal and group training, dance, and student clubs. Additionally, the center offers sports leisure classes that range from spinning to yoga. Just outside the facility are two pools: An outdoor 50-meter competition pool, with eight lanes and four diving boards, and a 2,400-square-foot recreation pool designed for lounging or a fun game of water volleyball. Rice also has a bicycle track on campus just west of the stadium. A tree-lined jogging trail makes a 3-mile loop around the campus. Rice matched its best season in Conference USA by capturing five sport championships: Baseball, Football, Men’s Golf, Women’s Swimming, and Women’s Tennis. The Rice baseball team has won 20 consecutive conference championships; only three other universities have streaks of this length or longer. The team has made eight trips to the College World Series since 1997. Rice’s football team won the 2012 Armed Forces Bowl. The broadcast on ESPN drew the highest rating for any non-BCS bowl. In 2013, the team advanced to the Liberty Bowl and, in 2014, the team won the Hawai’i Bowl. There are currently seven NFL players who are Rice alumni. Seven Owls were selected by major league teams in 2015 MLB Draft. Men’s tennis has made nine NCAA tournament appearances in the past 14 years, women’s tennis appeared in the NCAA tournament four years in a row since 2012, and women’s volleyball has made three NCAA tournament appearances in the past ten years. Varsity, Club and Intramural Sports Rice undergraduates pursue the highest levels of achievement in NCAA Division I sports. As a Rice student, you will receive free tickets to home games. You’ll be in the center of athletic excitement as you cheer Owls football in our 47,000-seat stadium, catch home run balls inside our $6.4 million Reckling Park, or enlist in the Autry Army to support the men’s and women’s basketball teams at Autry Court. Want to play? Club sports allow skilled athletes to compete in nonvarsity intercollegiate sports against teams from other universities. You can try out for nearly two dozen sports, including crew, lacrosse, soccer, tennis, fencing and even cricket and karate. The university’s intramural sports program, meanwhile, ensures that every student who’s interested has the opportunity to participate in competitive sports. Sign up to learn a sport you’ve never played before — badminton, floor hockey, inner tube water polo — or advance your skills in sports you played in high school. Beyond the campus of Rice University lies the fourth-largest city in the nation. Whether you’re attending a fascinating exhibition in the Museum District adjacent to campus, participating in a public service internship, or hopping on the light rail to enjoy the city’s diverse cultural, athletic and culinary offerings, you will soon see Houston as a vital part of your Rice experience. Quick Facts •	A hub for energy, bio- and nanotechnology, engineering and financial sectors, Houston is known as the energy capital of the world. The city serves as corporate headquarters for 26 companies listed on the 2015 Fortune 500, the third-greatest number of any U.S. city. The Texas Medical Center is the largest medical center in the world. The medical center consists of 59 institutions, including 22 dedicated to education and research. Houston is one of five cities in the U.S. with permanent professional resident companies in all of the major performing arts disciplines of opera, ballet, music and theater. Houston is home to the country’s third-	largest consular corps, and more than 90 languages other than English are spoken. Houston is the most ethnically and racially diverse city in the U.S.
Houston’s two major airports offer nonstop service to 190 cities worldwide. George Bush Intercontinental Airport is served by 23 airlines, and four airlines operate out of William P. Hobby Airport. •	Houston has nearly 50,000 acres of parkland, including 550 parks, public green spaces and open water. Passport to Houston The popular Passport to Houston program gives Rice students free or deeply discounted access to Houston’s cultural, entertainment and transportation options. Passport to Houston allows Rice students year-round, free, unlimited transportation on the city’s METRORail and bus lines. It also provides unlimited entry to the Museum of Fine Arts, Houston; the Houston Museum of Natural Science’s permanent exhibits and the Cockrell Butterfly Center; and the Houston Zoo. During the school year, Passport to Houston sponsors Rice Night events throughout the city’s arts and entertainment community. Endless Entertainment Choices More than 200 cultural, visual and professional performing arts companies call Houston home. Among them are the world-renowned Houston Ballet, Houston Grand Opera, Houston Symphony and Alley Theatre. And for the sports enthusiast, the Houston Rockets, Astros, Texans, and Dynamo offer year-round excitement. Rice? plan a visit Customize a Rice visit to include an information session, a campus tour, lunch with a current student and attending a class. High school seniors may stay overnight in one of our residential colleges. 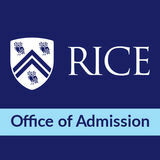 Go to http://admission.rice.edu/visit for a full list of options for your visit, and begin planning your trip. Our individualized, holistic and need-blind admission process examines an applicantâ&#x20AC;&#x2122;s academic prowess, creativity, motivation, artistic talent, leadership potential and life experiences.